Home / telangananews / THE ROADS ARE DUG IN GREATER.. THE ROADS ARE DUG IN GREATER.. The roads in the city are becoming murky. One of the reasons for the deterioration of quality standards with negligence of contractors, due to the tiredness of some officers, is one reason to allow the roads to be dug. On the other hand, the GHMC has allowed 3,572 km of roads to repair roads while the repair works are on the road. To provide a water pipeline in the city with a capacity of 2,700 km for watercraft, 588 km to Reliance Group, 84 km road cutting zone of power distribution division, 18 km for BSNL for protection needs of defense, 40 km for Lanthi as part of a smart project to set up city cameras Companies requested road excavation. The roads that Mama had seen before the Greater elections changed for three months. The Rs. 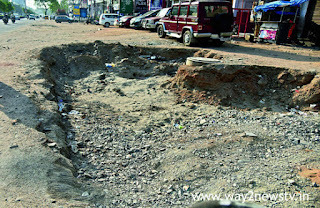 100 crore corruption of Rs 337 crore in the construction of these roads has been blamed on the media and accusations. The Vigilance inquiry has also been initiated against allegations that the hands of millions of rupees have changed. But it is surprising that no matter what is going on. Another Rs 75 crore has been set up to repair roads damaged by heavy rains. The Rs 337 crore spent on roads before the polls were recovered and Rs 75 crore were damaged in heavy rains after heavy rains. This means that the funds spent for the road ahead of the road are gemallal. There is no criticism that the government has been overlooked without any inquiry. Whatever rain comes, the city's opinion is that every year the roads are repaired for the repair and maintenance of roads and contractors. Besides, the delegates who question the mistakes made by the authorities are too promising to suspect. The GHMC governing body did not at least discuss the cost of crores of rupees on roads. The opposition has not even raised the debate. For the 912 roadworks in the city ahead of the Greater elections, Rs 337 crore has been sanctioned, 24 of which have not taken tenders for various reasons. The tender process for the 888 works have been completed and some work is completed, while some are still pending. The 709 works of Rs 242.98 crore have been completed and 66 works of Rs 28.25 crore are being executed. With the work of various departments, 113 works worth Rs 44.08 crore have not been opened yet. But there are allegations of corruption in these works. It was not discussed at the governing council meeting. The Opposition also made concern before Baldia. Nearly 180 kilometers of roads were damaged in Greater Hyderabad due to heavy rains in October and November. The GHMC specially allocated Rs 75 crore for this 180 km road reconstruction works. With this fund, 489 jobs were completed and 351 jobs were completed. Of these, 30 jobs have been canceled and 69 jobs have been stalled. 51 works have not been completed. Recently, tenders were invited for the repair works of the National Highways, and the contractors in the GHMCC earned jobs. The national highways took up and left the GHMC jobs down. Officials are unable to tell that these roadworks will be completed forever.